Hello Lovelies! Welcome to this week's edition of Frugal Friday! So glad you're here! 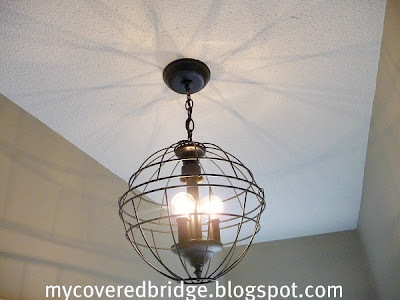 Last week's Fan Favorite was this darling DIY Orb Chandelier posted by My Covered Bridge. First up, I'm completely in love with this faux wallpaper created by Meeha Meeha. I mean in. love. Yes, I said faux...but doesn't it look like the real thing? I'm trying to come up with the perfect place to do this in my house. Seriously. 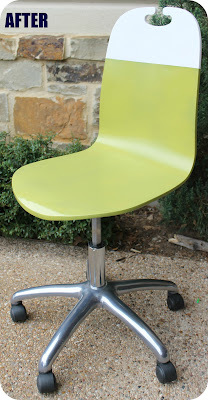 Next, I wanted to feature this great chair redo by Make Them Wonder for two reasons. 1 - because I love a good spraypaint makeover and 2 -because of the HUGE difference the two tone color makes. Love it. 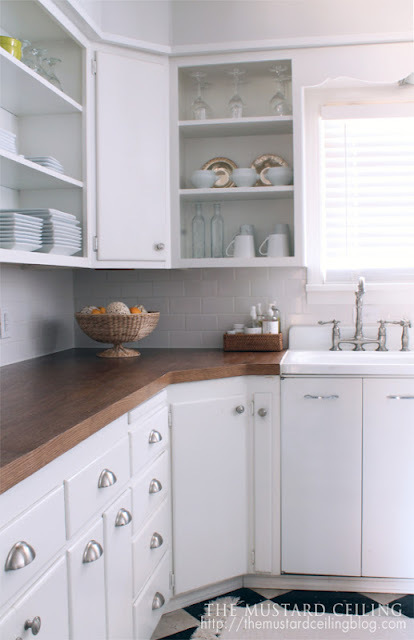 Finally, I love these fabulous DIY Wooden Countertops shared by Mustard Ceiling. And they only cost $100...what a steal! Simply beautiful! I'm so sorry but I had a mi up and added 3 linked I've linked in the past. I'm so sorry I didn't catch that sooner. *Chalkboard spice jars *Canvas Painting *wizard wand. I apologize again for the inconvenience. Thanks for hosting a great party. Hi Wendy, Thanks so much for hosting this great party! I have a great frugal friday item with - it only cost me a dime and my, what a great little thing for organizing bits of ribbon and lace! Thank you for hosting this party and giving me the opportunity to showcase my postal chair. Wishing you a wonderful Friday and a relaxing weekend! thank you once again for hosting a spectacular party! all of your hard work -- efforts and love each week are so appreciated! please know that! sending hugs and wishes for a fabulous weekend! Thank you very much, Wendy. Whoa, I am SO late this week, Wendy, but I thought you might get a kick out of my Spring "Sofa-Scape" since it cost me a whopping $0 to throw together (don't you love shopping your own house decor? : ). #334. Thanks for hosting...hope your weekend is FABULOUS! Hey Wendy! Thanks for giving my chair redo a little love today. I appreciate it! I'm in love with that faux wallpaper, also. What a unique idea. Thanks for sharing it and for hosting this great party. Thank you for featuring my wooden counter tops, what a nice surprise! Happy weekend.